Inventory shrinkage, spoilage, and, unfortunately, theft all combine to reduce the inventory that you physically have. In order for QuickBooks to reflect these fluctuations, you periodically physically count your inventory and then update your QuickBooks records with the results of your physical counts. In order to record your physical count information in QuickBooks, you use the Adjust Quantity/Value on Hand command, which is available to you in two different places. If you display the Item list, click the Activities button (which appears at the bottom of the Item List window) and choose the Adjust Quantity/Value on Hand command. You can also choose Vendors→Inventory Activities→Adjust Quantity/Value on Hand. Choosing either command displays the Adjust Quantity/Value on Hand window. Use the Adjustment Type box to indicate what you’re adjusting. You can adjust the quantity, the Value, or both. 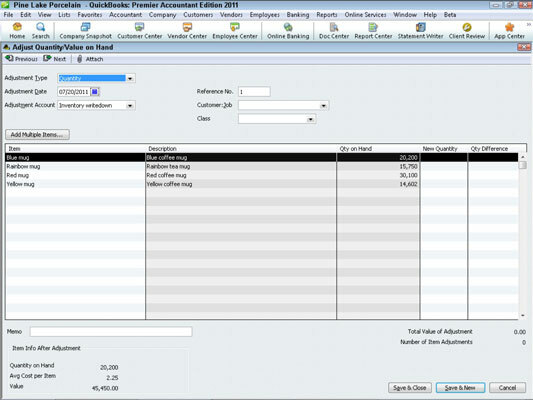 Select the appropriate entry from the Adjustment Type box: Quantity, Total Value, or Quantity and Total Value. Record the date of your physical count in the Adjustment Date box. Select the expense account that you want to use to track your inventory shrinkage expense from the Adjustment Account drop-down list. (Optional) Provide a reference number (if you use numbers) to uniquely and meaningful identify or cross-reference the transaction. If it’s appropriate, and in many cases it won’t be, use the Customer:Job box to identify the job associated with this inventory shrinkage. In a similar fashion, if appropriate, use the Class box to identify the class that you want to use for tracking this inventory shrinkage. Supply the correct inventory quantities and adjust the value. The Item, Description, and Current Qty columns of the Adjust Quantity/Value on Hand window identify the inventory items that you are holding and the current quantity counts. Use the New Qty column to provide the correct physical count quantity of the item. You can actually enter a value into either the New Qty column or the Qty Difference column. 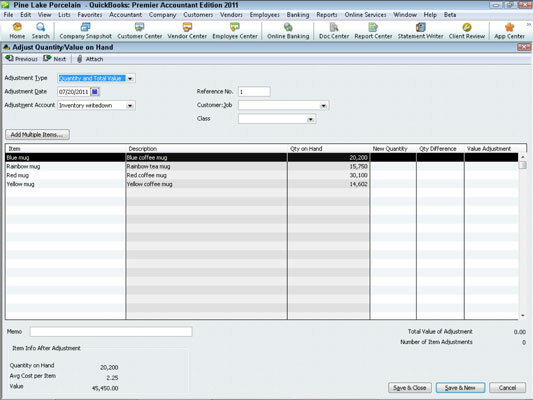 QuickBooks calculates the other quantity by using the current quantity information that you supply. If you select the Total Value entry or the Quantity and Total Value entry from the Adjustment Type box, QuickBooks displays an expanded version of the Adjust Quantity/Value on Hand window. Provide a memo description (if you want). Click Save & Close or Save & New to save the adjustment.